The beautiful Japanese exclusive versions of Barbie and friends are rare, always quite the find, and certainly an exciting addition to any collection! Some of the main differences you’ll find in the dolls that were limited to the Japanese market are the dark eyes that you find in the Skipper dolls, and the pink skin tone you see on the side part American Girls (who were actually exclusive to both Japan and Europe). The American Girls usually came on a pink-toned straight-leg body, but they can be found on the pink-toned bend-leg body too. They have also been found with a tan-toned straight leg body. It all can be a bit confusing! The side part Bubblecut is another variation. The major differences between the side part Bubble you’ll see from the Japanese market is her high color face (which were only found in Japan and Europe) and also her pink toned straight leg body. Some can be found on the pink toned bendable leg American Girl body as well. These dolls are also found in variations of swimsuits including fabric made from the American Girl Swimsuits and even fabric from Alan's swimsuit Jacket! An extremly rare Bubblecut would be one with a side part, pink toned body, with bendable legs and the dark hair color since surprisingly, this is the most rare of the hair colors in Japan. Dressed box Ponytails and Bubblecuts in western fashions can be a great find as well! The Francie dolls weren’t that much different from the U.S. Doll other than the eyes. The dark eyes are what set them apart. They came with dark hair as well. The blonde Francie was the same as the U.S. Version. The Japanese exclusive versions of Barbie’s wardrobe were almost always done with different fabrics that were brighter and bolder especially in the early years. The manufacturing of the clothing was not quite up to the standards of the U.S. versions either. It’s was all about quality control! Many of the Japanese exclusive outfits just didn’t fit that well. They were either too snug, or just too bulky. Some were made of lighter weight fabrics, and sometimes excluded the lining that you would find in the U.S. version of the same garment. The hooks and snaps wouldn’t always work properly either. Many of the outfits came just with the dress and the tiny little accessories that added that special touch would not be included. Other times you may see different accessories included instead. In 1962 the Kimono was introduced to the Japanese line of clothing. 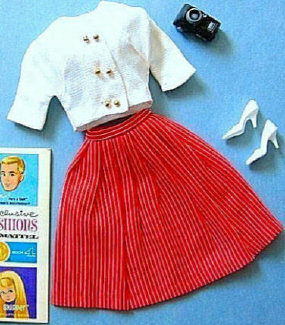 Several were made throughout the vintage years exclusive to Japan, but only one was introduced in the U.S. market which appeared in 1964 ‘Barbie in Japan #821”. The U.S. version was the only one that had a Barbie tag and came with several accessories. #11188 Dramatic Living Barbie from Japan Market (1970) This doll is made in Japan (not Taiwan) Click for here for details. The end flap of the box by where you see the hair color of the dolls has a white KB sticker showing the fashion the doll is dressed in. Also, there is a Tariff Stamp Sticker located inside the box by the dolls head. See below for a close-up look of the sticker.